Traveling to the SLC airport! Rancho Cucamonga here we come! MOMMY MOM!!! President and Sister Taylor are amazing!!! Yeah they know I’m from St. Geezy! Haha. They are sooo loving! That first night in the mission home was blissful. I got an amazing nights sleep and rancho is gorgeous!! 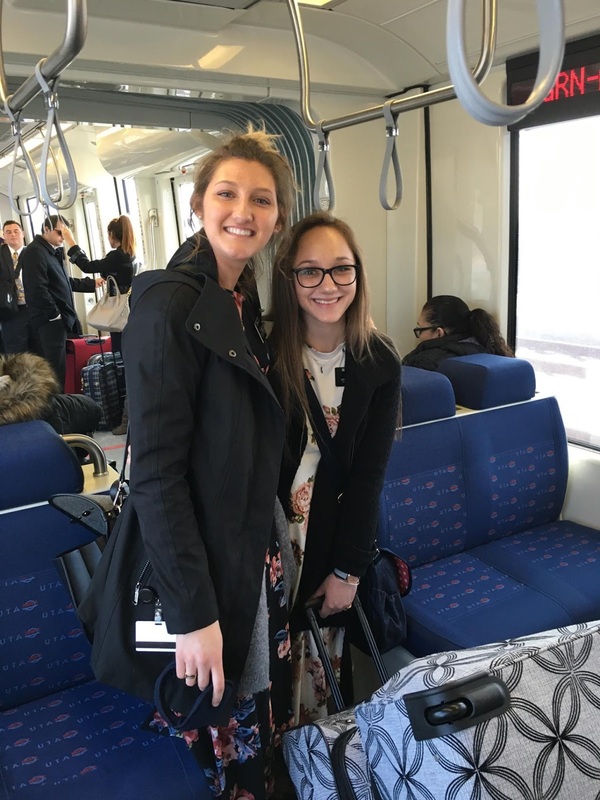 From the Rancho Cucamonga mission office: "They made it alive!" I’m glad all of you are reaching out to dad! I pray for the spirit to always dwell in our home and I pray that he can feel it! Can you tell Preston to email me? I miss that kid!! My trainer is sister Tate. She has just been out 5 months. We’re both learning a ton! We are white washing in Apple Valley and it is sooooo cool out here!!! Its just desert! Super dry and windy. The streets are just covered in sand and a lot of the roads are just dirt and super bumpy. I have been getting carsick a lot! NO ONE has grass here! Their yards are just dirt! We have run into a few really rude people but we just have to love them!! I’m obsessed with our ward! Its super small! There were only 5 people in Sunday school! I feel like we have been a part of this ward forever. Our bishop is like in his late 20s and we're all convinced that he’s going to be like president monson! All of the members know everyone and would stop at anything to help those in need. It was fast Sunday yesterday Sister Tate and I bore our testimonies! We’re having a blast meeting our ward family! Oh mom!! A super sweet old lady just got baptized into our ward 2 weeks ago. Her name is Debbie:) and she is a concert pianist! We are teaching her the recent convert lessons at the rest home she lives at. They are always playing classical music through the facility so she'll always stop us mid sentence and point out which composer that wrote the song that comes on. She reminds me of you!! She's super cute. All right. Here’s the info on our investigators. We don’t have any. We have been working really hard to find a lot of former and potential investigators but so far no one has been interested which is very discouraging. I knew that we would have days like this, but the whole week?? Oh well. This next week we are just going to look try and pray even harder! In the MTC I was frequently praying for humbling experiences. I guess Heavenly Father has been saving them for me till I got in the field! So yes, this week was very hard. I’ve been super sick since I got here, our heater in our apartment doesn’t work (it gets really chilly at night), my bed is uncomfortable and loud, we actually got chased by a dog and people don’t want to listen. But you know why I love all this? I haven't forgotten my purpose! I’m not our here for myself. I am out here to serve our Lord and Savior Jesus Christ and to bring people unto Him! What I experienced this week is nothing compared to what other missionaries have to go through! And especially what Christ went through in Gethsemane, on the cross, and really through His whole life. After this tough week, I feel even closer to my Savior. He knows exactly how I’m feeling. Whenever a negative thought would pop into my head, I would think of Him. Remembering Him fuels my fire to work even harder. I love being a missionary and this Gospel of Jesus Christ! Sorry this email was kinda negative. I guess I just needed to vent a little bit! But I promise I really love it here sooooo much! I love and miss my family! I pray for all of you everyday! Give everyone hugs for me!